Demolition of two small buildings is set to Monday on the site of Washington University’s $80 million project of apartments and stores in the Delmar Loop. Known as the loop project. The project announced nearly a year ago, is intended to add as many as 600 university students as Loop residents and increase the amount of retail space on Delmar Boulevard.The site, already owned by the university, is bounded by Delmar and Eastgate, Enright and Westgate avenues. Construction of a five-story building at Delmar and Eastgate is scheduled to begin in April after the two 1920s apartment buildings in the 6200 block of Delmar are razed. Work on two new buildings on Enright will start this spring after excavation for underground parking is completed, university officials said Wednesday. Construction of the second building on Delmar is scheduled to begin in September; no firm date has been set for the third Enright building. Paric Corporation is the general contractor. A sliver of the project’s 4.4-acre site is in the city of St. Louis. 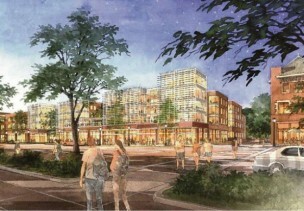 The rest is in University City, where the City Council voted Monday to approve the mixed-use development. When completed, the project will have as many as 265 apartments. Some apartments will be ready for occupancy in August 2014, university officials said. Chancellor Mark Wrighton said the development was a result of “a strong partnership” with University City and St. Louis officials. The project — designed by William Rawn Associates of Boston and Tao + Lee Associates of St. Louis — will incorporate “green” features, including bicycle storage, solar panels, rain gardens and 125 new trees to replace 58 trees that will be removed. Lumber from one of the trees, a bald cypress, will be used in a rooftop deck and in a trellis above Delmar, the university said. University officials said last year that they had examined several sites in the Loop area but pinpointed the Enright and Delmar locations as good places to provide housing and help meet the area’s retail needs. A study in 2011 by HR&A Advisors of New York and H3 Studio and Research Planning Group, both of St. Louis, found that Loop areas in University City and St. Louis could support 155,000 square feet of additional retail space. A growing Loop population will need more neighborhood services, such as a pharmacy and a dry cleaner, plus a grocery about the size of Culinaria downtown, the study said. University officials said Wednesday that they had yet to find tenants for the retail space on Delmar.